Like the intrepid fictional professor Indiana Jones, Daniel Kammen cuts a swashbuckling figure. As a trained pilot, he once flew medical supplies to remote areas of Kenya, ferrying patients back to Nairobi for treatment. Today, the 55-year-old globe-trotting energy and climate scientist and environmental policy wonk straddles two different yet distinguished worlds. 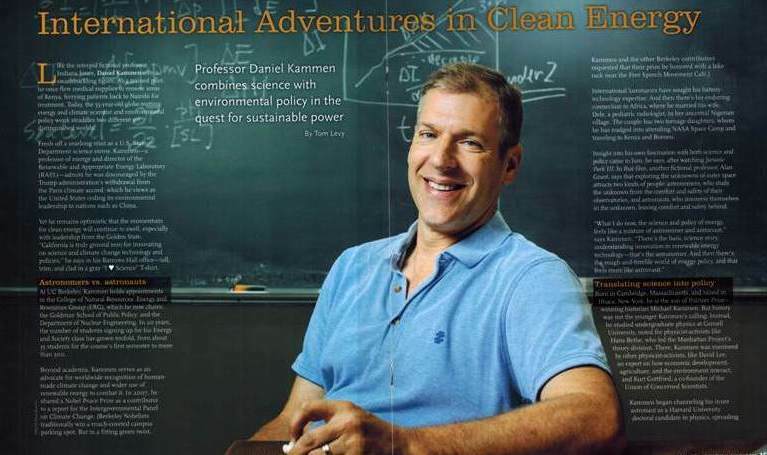 Fresh off a yearlong stint as a U.S. State Department science envoy, Kammen—a professor of energy and director of the Renewable and Appropriate Energy Laboratory (RAEL)—admits he was discouraged by the Trump administration’s withdrawal from the Paris climate accord, which he views as the United States ceding its environmental leadership to nations such as China. Yet he remains optimistic that the momentum for clean energy will continue to swell, especially with leadership from the Golden State. “California is truly ground zero for innovating on science and climate change technology and policies,” he says in his Barrows Hall office—tall, trim, and clad in a gray “I [Heart] Science” T-shirt.